What do you think? You want to try this again with me? I failed miserably last year at reading everyday. But I've had some interest from some fellow bloggers in it lately and if you want to read along with me, I'll try it again! the New Living Translation. It's super easy to read. comment with a link there) or leave your thoughts right in the comments. Spread the word! Use the button at the bottom to let others know what we are doing. Notice, I changed the second point from a whole post about the reading to a verse. Part of the reason these posts didn't get done is because I was just too lazy to write the post. Just being honest here. And just like always, making excuses for not spending my alone time with God. So are you in?Here's the button if you are! Copy the code. ========================================================================= Happy New Year 2011! Can you believe it? 2010 flew by. All the old people were right, time goes faster the older you get. Well, this year I've got a new resolution. Read my Bible everyday and finish it by next year. I did this successfully in 2009, but didn't quite get it done in 2010. My sister and I did it together that first year and we had a good time discussing what we had read. My six year old, Slone, has been asking a lot of questions this year. "Who made the sky?" "Who made the cows?" "Who made the trees?" Once I realized that most of his questions were answered with "God did", it really got me thinking. How amazing is our God that would think of little me, when there are much bigger things to worry about. It reminds me of the song by Tenth Avenue North "Hold My Heart"..."Could the Maker of the stars come close and hold my heart?" Would you like to join me?! Great! 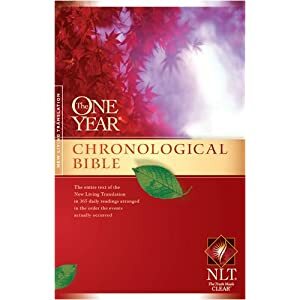 In order to follow along, get a one-year chronological Bible. I don't really think that the translations matter that much. The one I have is the New Living Translation. It's super easy to read. Read it everyday, then we'll check in here on Mondays. I'm going to write a post about it and I want you to either write your own post (leave a comment with a link there) or leave your thoughts right in the comments. That's it! 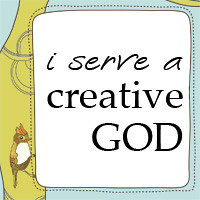 Hopefully we can get to know our Creative GOD a little better, as well as get to know one another better too! It was also brought to my attention that you can follow along on www.crosswalk.com instead of buying a new Bible. 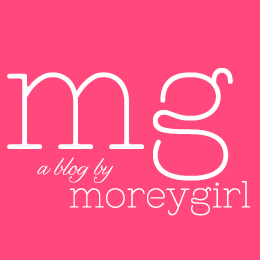 design by moreygirl. Powered by Blogger.